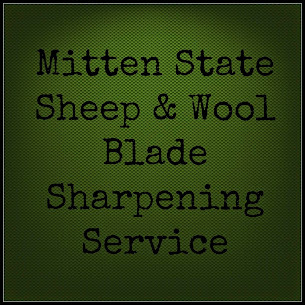 Mitten State Sheep & Wool : Is It That Time, Already? We rounded everyone up and separated the ewes and lambs. They are all protesting, even as I write (hours later) I feel a little badly for them, but they are more than ready to be weaned. The ewes need the break and the lambs need to get ready to be sold. The first 24 hours is always the worse. By tomorrow, they will already have started to settle down. Some wean the lambs as young as 2 months, we keep them with the ewes for about 4. We do not creep the lambs while they are on pasture with the ewes. They will be started on grain now. I hope to have the Ram Lambs for sale in about 4 weeks and the ewe lambs that we want to keep will be put back out on pasture around the same time. I am always surprised how fast the lambs grow and how quickly summer passes us by. Mike wasn't real happy that we had sheep last night when one of the Tunis Ewes reared up and head butted him. My goodness, they are incredibly sweet when they are newborn. I hope things have settled down in the pastures over night. They woke me up this morning! Sheep are not usually noisy, but they are not happy right now. It's good that the trauma doesn't last long! Hope they're well and good by now. Summer is so short in this part of the world! They'll be settled in a day or two. I always hate weaning. I bet it was a noisy night around your place! They sure have grown in such a short time.